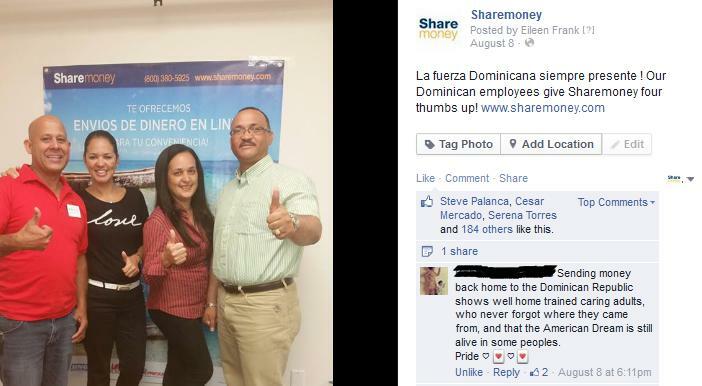 Posted on April 5, 2015 by Anastasia R.
Do You Send Money to the Dominican Republic? Everyone sends money overseas for a different reason. In other words, everyone has a story. What’s yours? We want to know! At Sharemoney, we believe that we are not just in the business of helping people to send money. We are in the business of helping people to send money to others, thereby allowing our customers to help and support the people they care about. We “heart” the enthusiasm of our Dominican customers and the pride they take in their home country, so we decided to help one of them travel back home to see the people they care about. If you are a Sharemoney customer, you have the chance to win a $600 Liberty Travel gift card which you can put towards the expenses of a roundtrip plane ticket to the Dominican Republic. All you have to do is visit our Facebook page and upload a video of yourself telling us why you send money to the Dominican Republic. Tell us your story! The winner will be announced sometime after January 1st. Visit Sharemoney’s official Facebook page for complete details!